Caroline’s soft voice drew the crowd closer. With attentiveness that no one expected nor planned for, her authentic words of vulnerability accomplished what some speakers only dream of but never achieve. 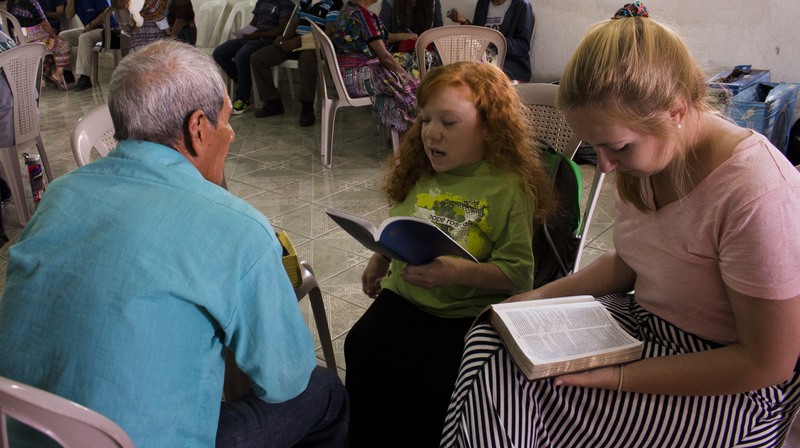 For Caroline, her size and stature began her testimony before she uttered the first word. Caroline Schuller serves with NBS2GO.com as a language coordinator. She is a full-time student at Moody Bible Institute. Her heart for the Lord and her passion for the world is evident to all who know her. The 20 minute video shown to the Ugandan women is available here. Mickey and I have had the pleasure of meeting you and your parents. What a blessing it is to become your friends. Your presentation is very heartfelt and meaningful through your strong faith. Keep up your important message to as many as you can here and around the world. Mickey and I have had the pleasure of meeting you and your parents. What a blessing it is to become your friends. Your presentation is very heartfelt and meaningful through your strong faith. Keep up your important message to as many as you can here and around the world. Stop everything and watch her video. Now. Disclaimer: I've been privileged to know Caroline since before she was born. But I've only really known her as "one of the Bible study kids." Caroline's testimony is amazing, powerful, and real. She IS God's masterpiece, and with humility and vulnerability she discusses this and how she knows it is true. And true for each of us. And how we can be certain of it, supported by Scripture references. I'm forwarding this video to at least three people who I know will be encouraged and blessed by it. Chances are you will do likewise! Stop everything and watch her video. Now. Disclaimer: I've been privileged to know Caroline since before she was born. But I've only really known her as "one of the Bible study kids." Caroline's testimony is amazing, powerful, and real. She IS God's masterpiece, and with humility and vulnerability she discusses this and how she knows it is true. And true for each of us. And how we can be certain of it, supported by Scripture references. I'm forwarding this video to at least three people who I know will be encouraged and blessed by it. Chances are you will do likewise!